This competition is now closed. Thanks to all who entered – your comments are very much appreciated. It was most difficult to decide on a winner so I asked my son to help me out and his choice was Lynn because she listed two of his favourites and also likes beans with her shepherds pie! Congratulations Lynn – please email me at gluttonyforbeginners@gmail.com with your full postal address. As is the case with most lovers of food or cooking I am fairly addicted to buying cookbooks and over the years I have acquired quite a collection. To me they are as much a part of cooking as the actual physical act itself and I like nothing better than to spend a lazy Sunday afternoon tucked up on the sofa reading one of my favourite cookbooks, savouring every picture and word, leafing through for inspiration, selecting recipes to try or comparing methods. I most definitely favour the books of cooks and food writers, especially Nigella Lawson, Nigel Slater, Tamasin Day Lewis and Hugh Fearnley Whittingstall (who by his own admission is a cook and not a chef) as their writing is so evocative and passionate and the recipes usually cater for everyday living and homestyle cooking, which is most definitely my preferred style. Having only purchased “Kitchen” this week I have not yet had a chance to read it in its entirety – that is something to be savoured and I fully intend to do that this weekend – but I have read the introduction and just reading Nigella’s words on the comfort of her own kitchen I already know this will become a much-used and well-loved addition to my own kitchen. So I thought it would be nice to give away a copy of Kitchen to one of my lovely readers to add to their kitchen and to enter I simply ask you to tell me in a comment what meal you like to cook, or indeed have cooked for you, at home when you are seeking heart-warming comfort. The winner will be selected from the comments below. Entrants must be resident in the Republic of Ireland and there is no cash alternative. Competition will close at 5pm on 31st October 2010. It has to be apple crumble. It is the best comfort food ever, just tastes like Sunday dinners at home and never fails to cheer me up. Ooh it’s got to be stew. Gorgeous Irish beef, slow cooked and topped with fluffy, herby dumplings. We serve it in big bowls with mash and roasted squash. Nomnomnom. Ooo…for me it’s definitely Shepherd’s Pie. When I need something heartwarming, comforting & satisfying there’s nothing nicer than a hot and bubbling Shepherd’s Pie straight from the oven. Does the trick everytime!! Chorizo, chicken, chickpea stew. Pretty much exactly what it says on the tin, with the addition of chili and tinned tomatoes. So good. Especially with cous cous. Especially if it’s been sitting on the stove all day – the chickpeas get so soft and absorb all the flavours and are just incredible. Like a hug in a bowl. Mmm. Oh that sounds delish. I have tried a similar soup but not cooked as long and the chickpeas always stay a little hard for my liking – must give that a go! thanks. When it’s cold outside, I usually crave a nice bowl of pasta, or a tray of lasagna, yummmm! Love pasta – and making lasagna on a cold wintery afternoon can be as relaxing as eating it :) delish. I have to confess I rarely make chicken soup! Disgraceful I know. Will have to change that very soon and I love barley or lentils in soup Thanks a mill for the recipe. Asian soup. I fry off prawns, chilli and spring onion. Then I add miso, chicken stock and bring to the boil. I add mint and pak choi. Seperately I cook noodles and add them and the juice of half a lime towards the end. Healthy, quick and definitely heart-warming. Oh yes! Asian soup – something to really warm the cockles and clear the airways :) and you almost feel quite virtuous after eating it (once I forget the can or 2 of coconut milk I may throw in!). Lovely suggestion. Oh…. I’m really stuck between homemade lasagne- I make individual ones cause I hate sharing the goey cheese that are yummy in in the corners!! and Shepard’s Pie-although i make it with minced beef my mam always called it Shepards Pie! This could be a weird one but I have to have beans ontop of the Shepards pie!! Haha! I’m with you on not sharing the gooey cheese :) perhaps I should make individual ones in future. I totally get putting beans on Shepherds Pie – son loves beans on the side with his. It has to be roast chicken, straight out of the oven, eating it with my fingers, that burn slightly on the hot flesh, and thick slices of bread loaded with butter, soaking up the juices. So good and so comforting. Oh man… I am starving now thinking about hot roast chicken in buttery bread. One of my favourite sandwishes. There is indeed something so very comforting about roast chicken. Was our usual Sunday dinner when we were kids – don’t know how my mum made one stretch between 7! For me, it has to be roast chicken with all the trimmings – stuffing, crispy roast potatoes, carrots and parsnips and of course, homemade gravy! YUMMY! Oh definitely gravy and stuffing! And I love sprouts and cauliflower cheese with mine too. So delicious! The lots left over for sambos the nest day, if you can wait that long! I’d have to say boeuf bourginon with creamy horseradish mash…its smells fantastic while it’s cooking, and tastes delish! Like a hug in a bowl! Sounds fantastic and I can almost taste it :) you can’t beat creamy mash and I love horseradish – fabulous. It has got to be roast chicken with all of the trimmings. It was my favourite meal of the week growing up (yes we had it every Sunday), just the smell of it makes me drool. I have gotten into the habit lately of making it every week. I now stuff the chicken with lemon and thyme a la Ina, to give the flesh a subtle flavour and toss my roasties in Semolina for that extra crunch. Totally nommy. I’m starving now just thinking about it all, hahaha. I love shepards pie with lovely creamy mash on top and lovely meat in gravy underneath, perfect when its miserable outside! Oh yes, a good Shepherds Pie needs lots of lovely savoury gravy to it. I can almost taste it now! So hungry. My ultimate comfort dish would have to be macaroni and cheese. I only eat it a few times a year on those occasions where I just feel like I need to be looked after. Lots and lots of cheese, to hell with the calorie content! It reminds me of being little and my Mum would cook it just for me as the rest of my family never liked it as much as me. Then, when I got older she taught me how to make it for a H.E class in school and last winter, when my boyfriend could finally eat again after tonsillectomy, I cooked it for him. It’s just that one dish that will always remind me of being looked after and looking after others. The ultimate comfort food! There is something so comforting about some Irish bacon with extra creamy mash potatoes and parsley sauce! Yum!! As a special treat I finish it off with some baked pears in caramel sauce! Mmmm!!! Lovely! Bacon (and cabbage) with mash and parsley sauce is my husbands’ speciality. Gorgeous. I love leftovers (minus the sauce) fried up the next day in a kind of hash. Yum. Love the sound of those pears too. The ultimate comfort food in our house is Fish Pie! There is nothing like turning the key in the door on a cold winter evening (or any other evening to be honest) and being greeted by the mouthwatering smell of Mams Fish Pie cooking away in the oven. It is always accompanied by warmed plates, Red wine, an expectant glance as you take your first mouthful and most importantly loads of chat about your day. She would never comment online herself so I just had to do it for her! It is the one thing guaranteed to cheer you up from the worst possible day, the best kind of Comfort Food there is! Hi Satine. Mmmmmmm fish pie… truly a comforting dish if ever there was one :) Well made, especially by mums, it is like a hug on a plate. Lovely. It has to be the guggy egg. 2 soft boiled eggs in a cup, a knob of butter, sprinkle of pepper & toast soldiers to dip into it. Perfect comfort & fast food. I have a couple – my Dad’s potato cakes topped with a fried egg and a side of sautéed garlicky spinach was a childhood favourite for rainy days and the blues. It’s something that’s still served up to me when I go home! Right now, it would probably be two slices of home made bread and a great, heartwarming soup. Jamie Oliver’s lentil and spinach or his chorizo and sweet potato are my current favourites. 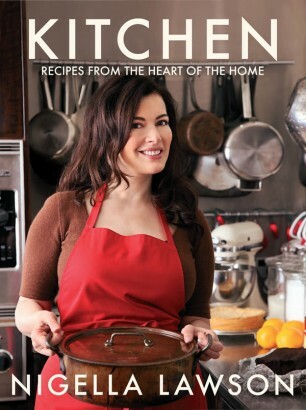 Great competition – I’ve been coveting Nigella’s latest since I first spied it in the shops! Your dad’s potato cakes sound delicious – nice to have someone make you a little something to perk you up :) Mmmmm love soup and homemade bread.